When you find your stomach growling on a road trip, you might be tempted to pull into the nearest Sonic Drive-In. The fast-food chain restaurant, which calls itself "America's Drive-In," is known for its hot dogs, burgers and beverages, including several flavors of milkshake. Although enjoying a shake might satisfy your sweet tooth, expect the refreshment to contain several hundred calories. If you enjoy a traditional flavor of shake, Sonic's line includes flavors such as vanilla, chocolate and strawberry. Each of the company's shakes is available in four sizes -- mini, small, medium and large. A vanilla shake in the four sizes contains 480, 540, 690 and 1,090 calories, respectively. In the same four sizes, chocolate shakes have 570, 670, 850 and 1,410 calories, respectively. If you prefer the taste of a strawberry shake, the four sizes contain 470, 570, 750 and 1,100 calories, respectively. Sonic's line of cream pie shakes offers the taste of your favorite cream pie in a drinkable form. The four sizes of strawberry cream pie shake contain 690, 750, 1,110 and 1,720 calories, respectively. The banana cream pie shake has 710, 770, 1,100 and 1,730 calories, while the coconut cream pie's four sizes contain 650, 710, 1,040 and 1,610 calories. 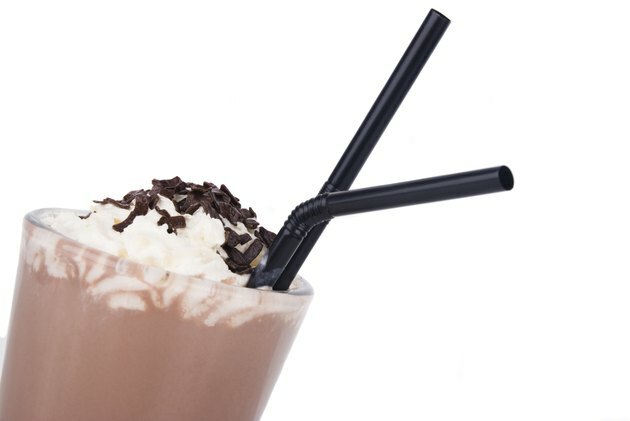 A chocolate cream pie shake has 730, 790, 1,200 and 1,850 calories, respectively. Several flavors of shakes on the Sonic menu include peanut butter, either on its own or paired with other flavors. The four sizes of peanut butter shake contain 660, 720, 1,060 and 1,640 calories, respectively. The peanut butter fudge shake has 760, 820, 1,260 and 1,940 calories, while the peanut butter banana shake has 720, 780, 1,120 and 1,760 calories. If you're indulging in a shake for breakfast, you might choose the peanut butter and bacon shake. This item contains 700, 760, 1,140 and 1,720 calories. Sonic's cheesecake-inspired shakes are rich, creamy and loaded with calories. The Oreo cheesecake shake's four sizes contain 770, 850, 1,210 and 1,810 calories, respectively. The cherry cheesecake shake has 640, 710, 1,030 and 1,590 calories, and the strawberry cheesecake flavor contains 670, 730, 1,080 and 1,680 calories. If you favor the chocolate cheesecake shake, expect to consume 710, 780, 1,170 or 1,800 calories, depending on your cup size. How Many Calories Are in a Dunkin' Donuts Vanilla Chai?